McClain’s Kaylee Stevenson watches her homerun ball in the bottom of the sixth inning on Wednesday at Mitchell’s Park in Greenfield where the Lady Tigers took on the Lady Ironmen of Jackson. GREENFIELD — The McClain Lady Tigers varsity softball team hosted the Jackson Ironladies on Wednesday at Mitchell’s Park in Greenfield for a Frontier Athletic Conference game and used clutch hits from Allison Beatty and Kaylee Stevenson in the bottom of the sixth inning to earn a 3-2 FAC victory. 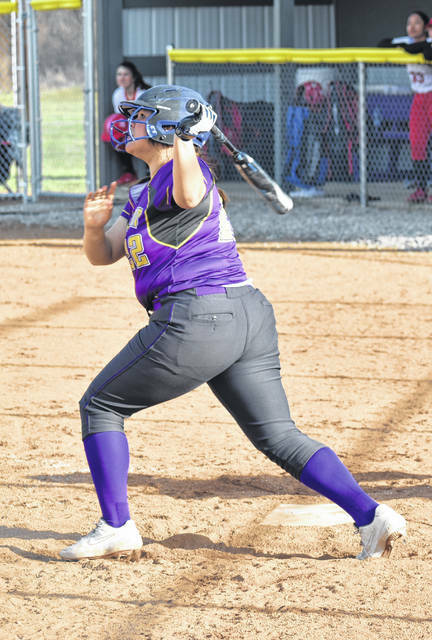 In the bottom of the sixth the Lady Tigers trailed the Ironladies 2-1 before A. Beatty and Stevenson propelled McClain to a 3-2 lead it would not relinquish. A. Beatty got things started with a blast to the center field that netted a triple and appeared to be on the way over the fence before it fell just out of the reach of the center fielder. Stevenson followed up two batters later with a two out, two strike blast that easily cleared the left field fence and drove in A. Beatty from third base to give the Lady Tigers the deciding two runs. McClain secured the victory in the top of the seventh inning with Stevenson making two consecutive catches, one moving to the right and one moving to the left, for the first two outs and Kyla Burchett completed the routine 4-3 put out with Kaleigh Easter to clinch the game for the Lady Tigers. Crabtree pitched a complete game and picked up her first win as a varsity starter while allowing six hits and two unearned runs. She also struck out four batters, walked two and allowed her defense to make plays behind her. The first run of the game for the Lady Tigers was scored by Brianna Weller in the bottom of the second inning when Weller smacked a double to center field and scored when Easter smacked a two out triple two batters later. Each of the Ironladies runs, in the second and fourth, were scored on errors by the Lady Tigers and T. Evans crossed the plate in both instances for Jackson. The win was especially important for the Lady Tigers because of the resolve and mental fortitude the team exhibited in a pressure packed game following a game at Adena on Tuesday that saw McClain commit 15 errors as a team in the 16-15 win. “We really challenged the kids … ‘I told them the six inches between your ears is the most important six inches on the field’ and the way that they hung tough in this one. We knew that it was going to be a battle, we knew Jackson was going to be very good … For us to get this win, to go 1-0, that was huge,” said Bolender. McClain is scheduled to travel to Miami Trace High School on Friday for another FAC rivalry game against the Lady Panthers.